New year, new book! My next novel comes out in two weeks. It’s a completely different genre, so I’m using a pen name. Get it? A possibility, but I wanted to publish as a man to stand out in a field ubiquitously female. Worked for J.K. Rowling, right? Well it worked after someone “accidentally” “leaked” the name. My name backward, but I didn’t like the looks of it. So here it is: Daniel Banner, writer of clean romance. 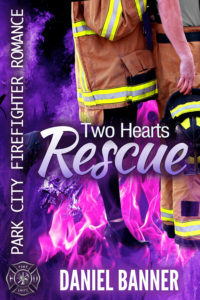 The first book is Two Hearts Rescue: Park City Firefighter Romance and is set in a fictional fire department in Park City, Utah. It comes out January 17. It’s available for pre-order on Amazon now! To keep up on books by Daniel Banner, like the Facebook page or sign up for his newsletter here. Cami Checketts’ book, Rescued by Love, is coming out Feb 1. Here’s hoping it’s a banner year for you and me!